Not far from Kamloops is the lovely rural town of Pritchard. On Duck Range Road was an old one room schoolhouse that was ‘adopted’ by a local farmer who had attended it as a boy and hoped some community-minded group would see to its preservation and restoration. Unfortunately, that never happened and in the summer of 2011, it was finally knocked down. Although this painting takes some liberties over the school’s original setting, the rendering of the building itself is true to the way it looked. 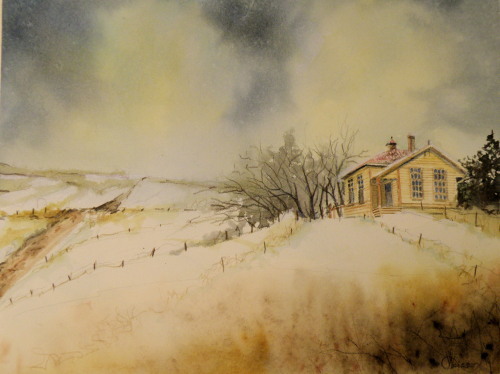 It was hung in The Federation of Canadian Artist’s Open Show in The Old Kamloops Courthouse, and was a favourite in a fund-raising draw for The Federation. "One Room School, Duck Range Road, Pritchard, B. C."